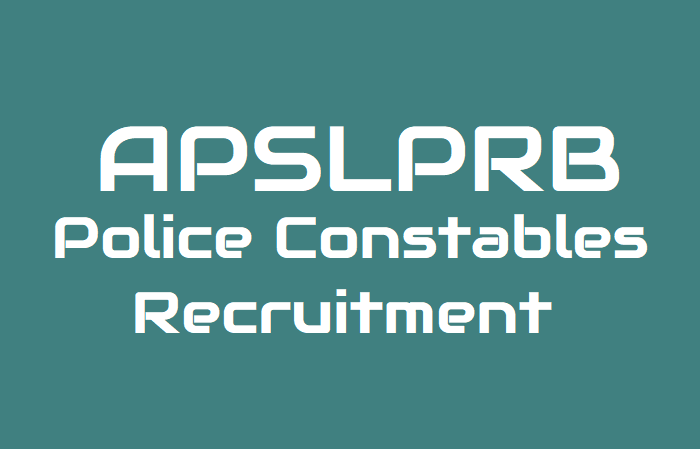 AP State Level Police Recruitment Board (SLPRB, AP) has published the Police Constables recruitment notification and invites application through ONLINE mode only in the prescribed proforma to be made available on WEBSITE (http://slprb.ap.gov.in/job-list) from 13-11-2018 at 1000 hours to 07-12-2018 at 1700 hours for the following posts. The number of vacancies indicated is only provisional and is liable for change without giving any notice. SLPRB, A.P., reserves the right to notify the modifications with regard to any aspect of recruitment during the process of recruitment. SLPRB, AP Police Constables, Warders Recruitment, Online application Form, last date for apply, Selection Procedure, Preliminary written test, Physical Measurement Test, Physical Measurement test, Exam date, Call letters/Hall Tickets, Final Written Exam and results details given here and also @ http://recruitment.appolice.gov.in/. The prescribed fee for candidate belonging OCs/BCs is Rs. 300/- (Rupees three hundred only), and for candidates belonging to SCs/STs is Rs. 150/- (One Hundred Fifty only) towards Applications Processing and Examination. A) Preliminary Selection Test: No Preliminary Selection Test will be conducted for the above Post. After registration of their Online Application, candidates have to report for verification of certificates and Physical Measurements Test which will be mentioned on Hall Ticket. B) Physical Measurements Test (PMT): The Physical Standards are mentioned at Para- 10 above. All candidates who meet the required standards will be declared as qualified. C) Physical Efficiency Test (PET): All candidates declared qualified as above shall be required to attend 1600 Meters run (1 Mile Run) which is qualifying. The candidate must complete the run in 10 Minutes or less time to qualify. D) Trade Test:- The candidates who qualify in the above Physical Efficiency Test will be required to appear and qualify in a Trade test. The Chairman, State Level Police Recruitment Board will constitute a committee for conducting this test with the officers from Police Transport Organization, Road Transport Corporation and Road Transport Authority. The candidates must qualify in the Trade Test carrying a maximum of 100 marks in ten parameters mentioned below, out of which at least 50 marks must be obtained. E) Final Written Examination: Candidates who qualify in the above Physical Measurements Test, Physical Efficiency Test and Trade Test shall be required to appear for a final written examination in one paper (three hours duration) as given below. The syllabus is given in Annexure I. Note: (1) The minimum marks to be secured by the candidates in order to qualify in the written examination in the paper is 40% for OCs, 35% for BCs, 30% for SCs / STs / Ex- Servicemen. (2) Questions in the Paper will be objective in nature and will be set in English & Telugu languages. Candidates have to answer the questions on an OMR answer sheet using Blue / Black Ball Point pen only. For this purpose, candidates should bring Blue/ Black Ball Point pens along with them. F) Selection: The final selection of the candidates will be made strictly on relative merit, as obtained by them based on their score in the written examination (200 marks) for the candidates who qualified in Physical Efficiency Test and Trade Test. The provision of “The Andhra Pradesh Public Employment (Organization of Local cadres and regulation of direct recruitment) Order, 1975”, the rule of reservation to local candidates is not applicable”. G) Preference: When two or more candidates in a particular category obtain equal marks, preference will be given to the candidate who was born earlier. A) Preliminary Selection Test: No Preliminary Selection Test will be conducted for the above Post. After registration of their Online Application, candidates have to report for verification of certificates and Physical Measurements Test which will be mentioned on the Hall Ticket. B) Physical Measurements Test (PMT):The Physical Standards are mentioned at Para- 10 above. All candidates who meet the required standards will be declared as qualified. C) Physical Efficiency Test (PET):All candidates declared qualified as above shall be required to attend 1600 Meters run (1 Mile Run) which is qualifying. The candidate must complete the run in 10 Minutes or less time to qualify. D) Driving Test: The candidates who qualify in the above Physical Efficiency Test will be required to appear and qualify a driving test. The Chairman, State Level Police Recruitment Board will constitute a committee for conducting this test with the officers from Police Transport Organization, Road Transport Corporation and Road Transport Authority. The candidates must qualify in the Driving Test carrying a maximum of 100 marks in eight parameters mentioned below out of which at least 50 marks must be obtained. E) Final Written Examination: Candidates who qualify in the above Physical Measurements Test, Physical Efficiency Test and Driving Test shall be required to appear for a final written examination in one paper (three hours duration) as given below. The syllabus is given in Annexure I.
F) Selection: The final selection of the candidates will be made strictly on relative merit, as obtained by them based on their score in the written examination (200 marks) for the candidates who qualified in Physical Efficiency Test and Driving Test. The provision of “The Andhra Pradesh Public Employment (Organization of Local cadres and regulation of direct recruitment) Order, 1975”, the rule of reservation to local candidates is not applicable”. When will come PCs mechanic trade test result release.